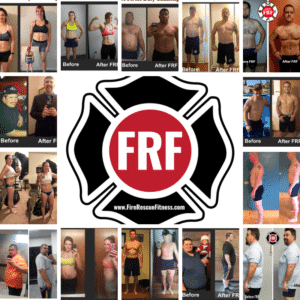 Discover the FRF Workout Programs trusted and used by thousands of Firefighters. The FRF Fit for Duty Challenge Workouts are the culmination of the lessons learned from the feedback and results seen from my previous program creations. I decided to take the best workouts and training aspects and put them to use in this one effective workout program. The Fit for Duty Challenge was born from the efforts of thousands of hours of research and from the impressive results from the thousands of firefighters, EMTs and medics that have used FRF workouts and training protocols. These workouts are the most comprehensive workouts Firefighters, EMTs and Paramedics. They will improve every aspect of your fitness (conditioning, strength, cardiovascular recovery, core power) and make you strong, lean, athletic and efficient. Click here for more information and to Join the Fit for Duty Challenge.